GPS: N31° 45' 46" W106° 28' 39.4"
A striking adobe structure, Magoffin Home State Historic Site explores the stories of a multicultural family who actively participated in U.S. expansion and settlement, military service, trade on the Santa Fe–Chihuahua Trail, Civil War turmoil and U.S.–Mexico relations. The 1875 home is a prime example of Territorial style architecture. Destress and stretch with Rebecca Hendricks at our Visitor Center. If you are resolved to improve your health, then you won’t want to miss this free yoga class! Looking intently into each other’s eyes, Lt. William Glasgow and Josephine Magoffin met in Fort Bayard, New Mexico, sometime between April 1892 and May 1895. It was the start of a love affair that would last for 71 years. Take the virtual tour and see the video! 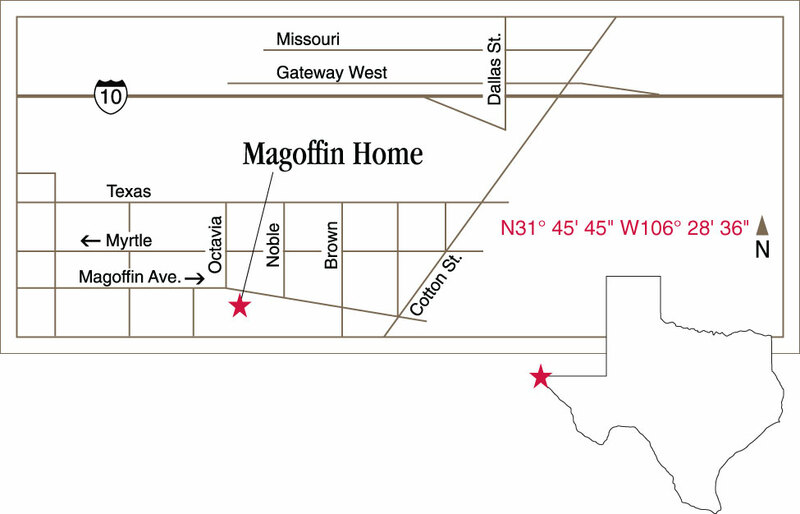 Download the Magoffin Home visitors guide (PDF) for a snapshot of the site. Help us preserve Texas history. Donate now to support the preservation, education, and outreach activities of Magoffin Home.